Protection rackets are running wild in the streets of Italy. The poor shopkeepers are fed up, but feel they are powerless against the muscle of the ever-increasing criminal gangs. The baddie of all baddies, a psychopath named Valli (Mezzogiorno) is not only the king fish all the cops want to catch, but is also a vicious killer and even a “phone bomber”, a guy who exacts payment by placing bombs in telephones, so when someone calls your business - kaboom. But Valli has met his match in the take-no-guff police commissioner Grifi (Bozzuffi). Grifi wants to clean up the streets, so, noticing that he and his force are not dealing with ordinary criminals, they come up with an extraordinary solution. 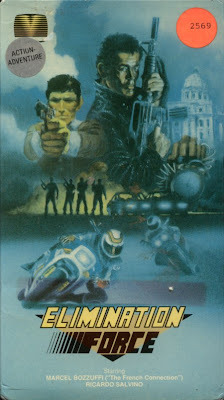 Saying “simple cops can’t beat ‘em - we need commandos”, Grifi forms the Stunt Squad, a highly trained band of law enforcement that ride super-fast motorbikes and shoot to kill. But will it be enough to stop Valli? Find out today! We here at Comeuppance Reviews absolutely love the 1970’s Italian Poliziotteschi movement, and this seems to be one of its lesser-seen titles. We can’t seem to get enough of movies of this place and time, and apparently they were borne out of a real-life crime epidemic in the Italy of the day. The locations, the fashions, and the music all gel together with the violent plots and the result is addictive viewing. The power-team of writer Dardano Sacchetti, director Domenico Paolella, and the score by Stelvio Cipriani provide a solidly entertaining addition to the genre. Director Paolella seems to be concentrating on certain aspects not always associated with these types of Italian crime films - for instance suspenseful setups and varying uses of pace. At one moment, it seems slow, but then it speeds up, almost like the dynamics of the music of Cipriani. 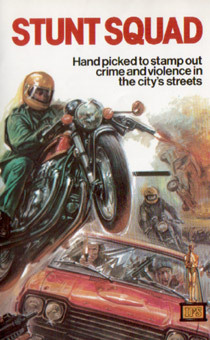 Plus this movie has one of the coolest training sequences we’ve seen in some time: in order to properly train his guys to become the Stunt Squad, they have to practice hitting targets with their guns while zooming on their motorbikes, and to somehow fit collaring criminals into their wheelie-popping schedule. Naturally, there are some great chase sequences, among other fine moments. Probably our only complaint about this movie is that it could have used more Stunt Squad. There are some pretty lengthy sections without them. But that’s a minor quibble for this enjoyable movie. The film was released on VHS in North America on the cleverly-named label Lettuce Entertain You. Not only is this lettuce Canadian, but it’s thought that it might be a bootleg (or at the least, grey-market) tape. That might help explain the fuzzy, washed-out, poor quality of the VHS. While we recommend this movie, we don’t recommend this tape. Sad, it does the film a disservice, but it’s a testament to the film that it can overcome these shortcomings and still manage to entertain. But on the upside, the dubbing does give us gems like “You have to start combing Bologna to find Valli”. While they’re clearly talking about the region in Italy, it’s not every day you hear the words “combing Bologna” said. Or done for that matter. It just sounds funny. Perhaps the reason why Elimination Force hasn’t joined the top tier of Poliziotteschi titles is because more people don’t know about it, because of its unfortunate release on Lettuce Entertain You. Hopefully that will start to change, and if we’re lucky, a DVD release will correct the record. Very cool review. I always appreciate your views into the action genre. I would love to explore 70's Italian action...when I'm not watching family movies and other junk. This one sounds pretty solid. I think I'm going to start my own Stunt Squad. Thanks! That is real nice of you to say that. Would love to read your take on some 70s Italian action. Do you have any favorites? Also haha, we need Stunt Squads more than ever now!